All over Twitter and Facebook, citizen commentators are offering a solution to end the partial U.S. government shutdown: airport workers should just go on strike. "How many hours after all the TSA workers went on strike would the government be re-opened?" tweeted consultant David Rothkopf, a sentiment echoed throughout the Twittersphere, calling on Transportation Security Administration workers and air traffic controllers to not show up for work. How many hours after all the TSA workers went on strike would the government be re-opened? "The employees of the TSA can do even more. I propose a MASS sickout in Atlanta, the Monday after the Super Bowl. I'm not saying to disrupt the game...but make it impossible for those people to go back home. MAKE Congress and the President pay attention," radio host Joe Madison tweeted. But striking is illegal for federal workers. (Bettmann Archive via Getty Images) Members of PATCO, the air traffic controllers union, hold hands and raise their arms as their deadline to return to work passes. 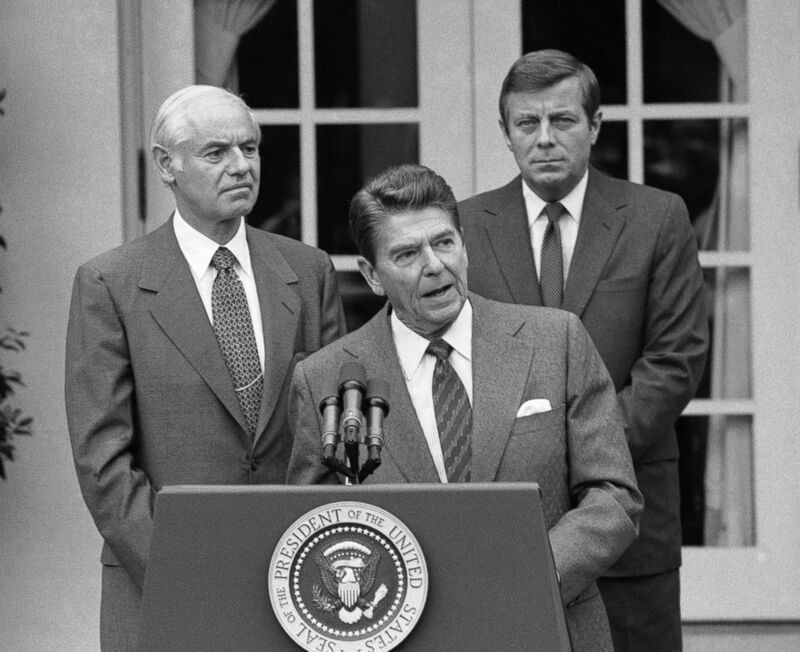 All strikers were fired on the order of President Reagan on Aug. 5, 1981. "Federal employees are governed chiefly by the Federal Service Labor Management Relations Act of 1978. That statute prohibits strikes by federal workers," University of Michigan law professor Kate Andrias told ABC News in an email. Moreover, the act bars workers from getting a future federal government job "if he or she 'participates in a strike, or asserts the right to strike against the Government of the United States," Andrias added, quoting the act. For many air traffic controllers, whose ranks are already at 30-year lows, the last strike has been seared into their memories. In 1981, nearly 13,000 controllers walked out after contract talks between their union, The Professional Air Traffic Controllers Organization (PATCO), and the Federal Aviation Administration broke down. Then-President Ronald Reagan fired 11,000 controllers within days and the union was decertified. Reagan also instituted a lifetime ban for working for the FAA for the striking controllers. While then-President Bill Clinton issued an executive order to modify the ban, "it's a short shelf-life profession," Georgetown University history professor Joseph A. McCartin told ABC News. There's also a mandatory retirement age of 56. "That's more than 13 years," McCartin, who wrote a book about the PATCO strike, explained. "Many were not interested in coming back." Were they to strike today, federal workers could face prosecution and even jail time. (Jeff Taylor/AP, FILE) President Ronald Reagan, flanked by Attorney General William French Smith and Transportation Secretary Drew Lewis, gives striking air traffic controllers 48 hours to return to work or be fired during a briefing in the White House Rose Garden in Washington, Aug. 3, 1981. "While the clear majority of states make public-sector strikes illegal, the statute covering most federal employees has some of the toughest penalties for illegal strikes. Specifically, the statute covering most federal workers makes striking a crime, which is unusual," Joseph E. Slater, a law professor at the University of Toledo and an expert in public sector labor law, told ABC News in an email. "The typical penalties are (i) you can be fired and (ii) you and your union can be fined. But in addition to that, you can be jailed for striking against the federal government. 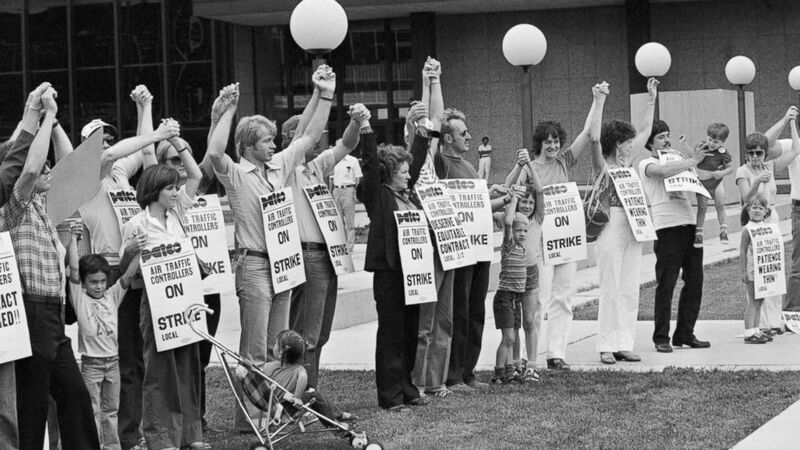 And indeed, a number of the PATCO strikers were back in the early 1980s," Slater explained. The suggestion of a strike, or another way to walk off the job, is something Nick Daniels, president of the National Air Traffic Controller’s Association (NATCO) Fort Worth Center's chapter hears a lot. But as a union leader, he's well aware of the penalties. "You know, missing pay is difficult enough, and to lose liberty would definitely be a thing that none of us would want to do," Daniels told ABC News. Plus, there's the fact that air traffic controllers take their jobs very seriously. "They are the guardians of the sky who have to be 100 percent right 100 percent of the time. And they take great pride in that weight that they carry on their shoulders for that job," Daniels said. In addition, Daniels said, "they do not want the American public to pay for this government shut down. They don’t want them to pay for it just like we don’t want to have to pay for this argument that’s going on in the political side. All that would be is us passing off that same type of feeling of being mistreated or being upset to someone else who doesn’t deserve it." Despite not being able to strike, the strain of overtime and financial stress has had an effect. The controllers union did confirm at least two of their members had resigned over the shutdown. "Failure to provide wages for work performed ... United States Government instability causing undue stress to me and my family and the ability to maintain two households," an unidentified air traffic controller wrote on his SF-50, a federal form detailing personnel changes that ABC News obtained a copy of. A controller trainee in Wisconsin delivered a hand-written resignation on letter on Jan. 18 that was also obtained by ABC News. "To whom it may concern, I am an Air Traffic Control Specialist in training at Madison ATCT. Due to financial hardship as a result of the government shutdown, I am forced to resign from my position and seek employment elsewhere. I hope for my coworkers and friends that this shutdown ends, as I worry that I may not be the last developmental forces to resign from an already under-staffed facility," the trainee wrote. Training has been halted during the shutdown. Meanwhile, TSA workers have been calling in sick to work at a rate double of that a year ago. On Monday, 7.5 percent of the TSA workforce called out, compared to 3.3 percent on the same day last year. The TSA acknowledged the strain in a statement: "Many employees are reporting that they are not able to report to work due to financial limitations." ABC News' Christine Theodorou contributed to this report.